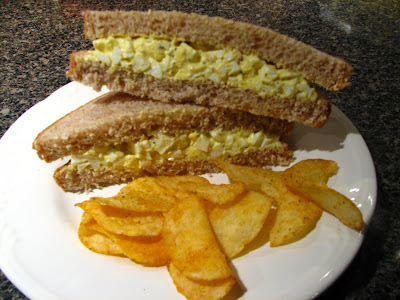 Lynda's Recipe Box: The Egg Salad Sandwich! Behold, the Egg! Yes, I love eggs; have since my earliest memories. Of course, at this time of year Easter Eggs come to mind. We had lots of those growing up. But I also love all the other things you can do with eggs; deviled eggs, omelets, egg casserole, boiled eggs, fried, scrambled eggs, and the fabulous Egg Salad Sandwich! Of course, we can do so much more with these delicious orbs. They are the ingredient in so many recipes. Eggs have sustained generations of our ancestors! Place 4 eggs in a sauce pan and add enough cold water to cover them. Place pan on burner and turn to medium high heat. When water comes to a boil, turn heat to low and cover pan. Simmer for about 10 minutes and then turn off heat. Leave the lid on to keep the heat in. Mix it all together and refrigerate until cold. Before eating, taste and adjust seasonings if needed. This is enough for 2-3 sandwiches. Enjoy! They are so creamy and good! As an added note, today is my Wedding Anniverary! My amazing husband and I have been married 31 years! It sounds like a long time, but at other times I wonder how we got here so fast! Either way, it's been a great life! Happy Anniversary! Amazing how fast the time flies, huh? I haven't had egg salad in a long time... sounds good! I always forget about egg salad sandwiches, but when I have one, I really like it and wonder why I don't have them more often. Happy Anniversary! Thirty one years is something to celebrate! Love the egg salad sandwich! yum!! oh...and I, too, will be celebrating 31 years. In June. And I know what you mean...where did the time go? Happy Day to you!! Oh what I would give for one of those sandwiches right now. I know what I am making for lunch tomorrow. You make them just like I do. this brings back memories of school lunches - delicious! I love egg salad sanwiches too. We made some a couple of Fridays ago. You have my tummy growling, man that sandwich looks great! Great blog. I've never had egg salad sandwiches, only tuna, chicken, or ham salad. They look great though. What a great way for me to use up all the easter eggs my kids will by dying! I love your blog. Great photos! The recipes are all of my favorites! 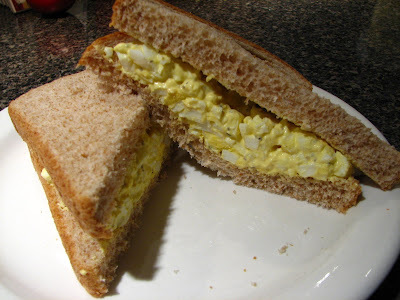 Egg salad sandwich--yum! I will be back for sure. Thanks for sharing. I love egg salad sarnies, and they don't need too much dressing up, these are perfect. Belated congratulations on your 31st wedding anniversary. I wish you both many more. Very happy anniversary. The egg salad looks so appetizing. I wish I could take a bite right now.